Welcome back the Arne Wellness Center blog. In our recent posts, we looked at how chiropractic care and massage therapy are both effective natural alternatives for treating Lyme disease. For those living with Lyme disease, another aspect to consider is your diet and how your eating habits can either contribute to or relieve symptoms associated with this condition. When a person is infected with Lyme disease caused by spirochetes that enter the skin by way of an infected deer tick, the body’s natural reaction to foreign entities is an inflammatory response. This response usually presents at first as a rash, and then gradually begins to affect the muscles, joints, and nerves throughout the body. You can read our earlier blog series to learn more about additional symptoms of Lyme disease. Because Lyme disease affects both the central and peripheral nervous systems, Lyme patients often develop chronic inflammation; however, by eating a healthy diet full of nutrient-rich foods that fight, inflammation can ease the pain and discomfort caused by inflammation. Here are some of the best foods to fight inflammation. Green tea has been revered for centuries for its beneficial healing properties. All green tea is packed with catechin, one of the most potent classes of antioxidants. Drinking green tea and green tea brewed from powdered matcha are some of the best ways to get your fill of inflammatory-fighting antioxidants that also supports a strong immune system and healthy digestion. In fact, just one cup of matcha tea provides ten times the amount of antioxidants provided by one cup of regular green tea. These sweet blue gems also pack an antioxidant punch. Eating a cup of blueberries daily may significantly reduce inflammation because they contain flavonoids, another powerful class of antioxidants. Additionally, blueberries contain anthocyanins, vitamin C, and resveratrol, all of which support a healthy immune system, fight free radicals, and reduce inflammation. Fish like salmon, tuna, flounder, mackerel, and sardines contain omega-3 fatty acids that combat inflammation. The key to a healthy diet among Lyme disease patients is to limit eating foods high in saturated fats found in processed foods which actually contribute to inflammation in the joints and muscles. Good fats found in fish, on the other hand, not only fight inflammation, but also provide the body with protein to support a healthy immune system. Additionally, omega-3s found in fish are considered “active,” meaning they may fight excess inflammation by stimulating adiponectin, a hormone that encourages muscles to use carbs for energy more effectively. You’ll want to skip the fried fish, however, and instead opt for baked, boiled, or grilled fish. And if you’re not a fan of seafood, try adding fish oil into your daily regimen to get the anti-inflammation benefits that it may provide. These are just a few of the best foods to fight inflammation. 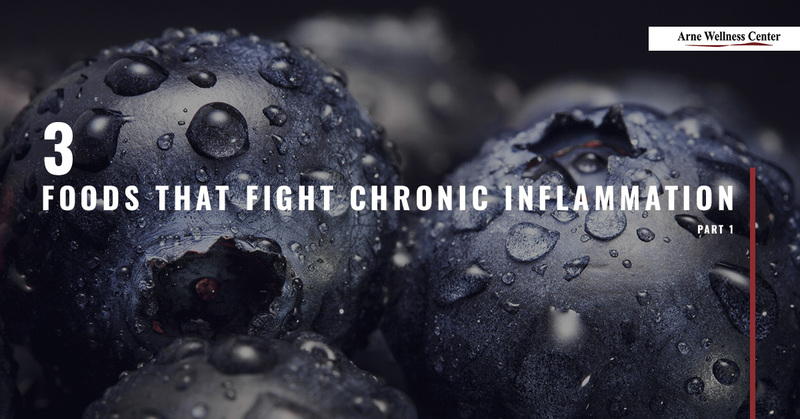 Be sure to join us next time as we look at more inflammation-fighting foods for Lyme disease patients who experience chronic inflammation as result of this condition. Contact Arne Wellness in Littleton to meet with our Lyme-literate chiropractor who can provide chiropractic care, acupuncture, and nutritional counseling to reduce inflammation and improve healing.